It sometimes takes a life-changing experience for someone to gain a fresh perspective on life. For Adrian Pang, one of the most prominent faces in the Singapore film, television and theatre scenes, it took a few personal crises. To kick things in motion, the veteran actor left MediaCorp TV in March, after a three-year stint. He has since started ‘Pangdemonium! Productions’, a theatre company, with his wife, Tracie Howitt – also a familiar name in the local theatre circuit. His motivation: to rediscover his passion for the stage, where he had first started out. 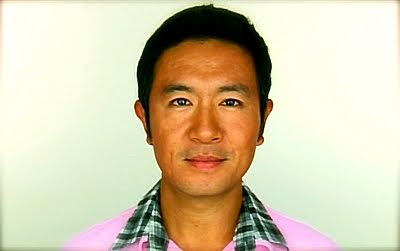 Adrian signed up as ambassador for Pink Dot 2010 because he shares in the belief that everyone should be free to love. “Lately, I’ve been thinking a lot about life and my place in the world in the grand scheme of things, especially about my role as a husband, father, son and friend. The conclusion that I’ve come to is that we are nothing without love; we are nothing without the freedom to love and to be loved,” he said. For Adrian, Pink Dot is a meaningful symbol of how we all have a right to love and be loved, regardless of who we are or whom we love. Such are the values that he wants to impart to his two boys – to teach them that life is so much happier when we live with love, understanding, generosity of spirit and compassion. Adrian chose to champion Pink Dot, in particular, because it represents the freedom of LGBT Singaporeans to live meaningful lives. He recalled the story of a friend from school who had struggled with his sexual orientation for a very long time. “He was very talented, but always very reserved. He kept to himself a lot of the time. There was something about him that always struck me as ever so slightly mysterious, but nobody questioned him,” he said. It turned out that this friend had deliberately kept himself at a distance. Many years would pass before he finally “confessed” his “deep secret” to a mutual friend. This is a story that saddens Adrian because he believes that no one should have to go through such struggles alone – of being in denial and not having anyone to talk to. Adrian believes that open minds and open communication channels are key to strong families. His idea of a close-knit family is one where family members feel safe and comfortable enough to share openly and honestly. This, of course, is an idealistic notion to strive towards. In reality, things are not always so simple as “you can’t choose your family”. Many LGBT Singaporeans rely on their friends for support, not their families, he observed. While some level of support is better than no support at all, LGBT Singaporeans stand to lose out on strong family relationships. Adrian’s view is that such patterns are not likely to disappear anytime soon as the wider society will take some time to understand LGBT issues. That is why Pink Dot is significant. For him, it represents a start to building positive attitudes for a more open and inclusive society.